Posted on 10 December, 2018 at 3:03 pm. Thanks to everyone who came from all over Australia to the Dental Mastery Conference in Melbourne on the weekend. It was great speaking to such an enthralled crowd. I hope everyone left with a better understanding of branding and digital marketing. It’s only retrospectively that I noticed that Microsoft has endowed me with some king of special powers. I’m not sure that Wonder Woman’s headband is the look I would normally tout. I’ll have to think more carefully about where I sit next time. I know quite a few of you were trying to madly take notes on a few of my presentationslides, so here are a few of the key ones. 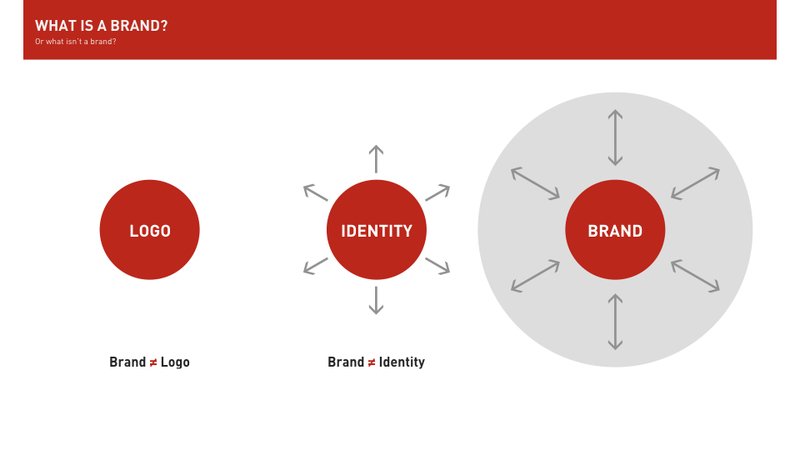 Below is the slide I hope gave you the greatest insight int what a brand really is. I’m sure a part of me has just include this because I still can’t believe Chanel made a boomerang. 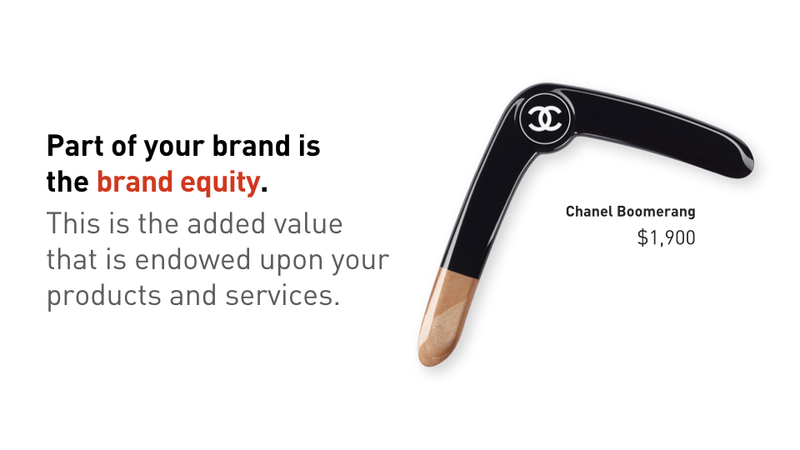 But more importantly I hope it helped you understand what brand equity is. 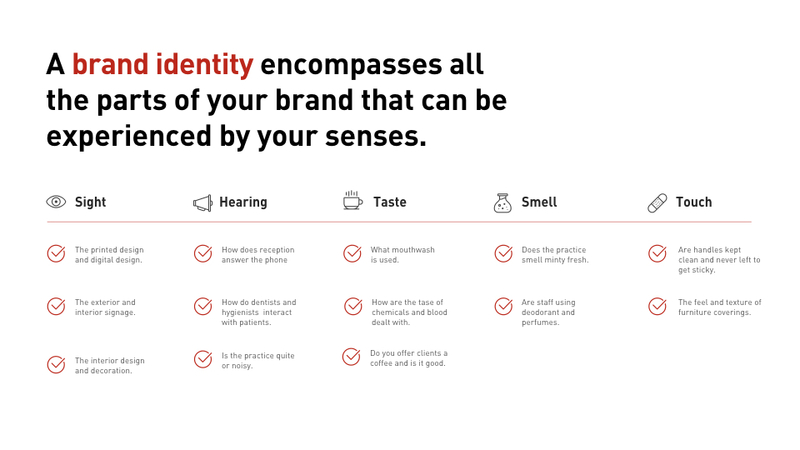 How it can not only be transferred between other goods and services, but also from the elements of your visual identity. Hence a quality business card, signage or website will enhance your clients’ belief in the quality of your goods or services. I saw a few of you trying to take photos of this one. I know it is not a quintessential list, and some thoughts are more focused on the frivolous, but still seeing your brand from all dimensions is imperative to success. Posted on 30 April, 2018 at 11:36 pm. It used to be common practice not that long ago to see lots of fake backlinks. Links that directed traffic back to your website have been one of the most important SEO factors for quite some time. They meant that you were credible website with important information. So important that other sites were referencing you. Of course, people very quickly started to create their own backlinks. Websites appeared all over the web that offered nothing but backlinks. If you sought them out, all you saw was pages upon pages of links with no valuable content. Google’s guidelines for link schemes forbid it, but with no way of detecting them it was a quick way to boost your ranking. But like the lawlessness of the wild west, eventually the sheriff hunts you down and you end up with a noose around your neck. Google developed new algorithms that could detect the quality of these links and their sources. Many companies were blacklisted by Google and lost all ranking. The companies that sold these services still walked free with a wallet full of cash. The companies that bought these SEO services all claimed innocence, while the SEO companies all claimed that they were just playing within the law. It was a bit like punching someone on the football field: sure, it’s a vicious crime in society, but on the field, it’s just a free kick and a week’s suspension. The question has to be though, were they so innocent? No one could possibly be so stupid as to not check on the credentials of their accountant, lawyer or the digital marketing firm that represents their company. Every conversation I have ever heard of after the event has involved someone telling the client that they can assure them of number 1 ranking on Google via their manipulation of the system. So how do you create good backlinks now? Firstly, the best backlinks are often not created by you or anyone else you could coerce. The best backlinks come from genuine websites which might have similar interests. If you create great content, people will share it. It might take time and you may have a lot of content that doesn’t hit the mark but that is allays what is going to serve you best. This is what the user is looking for and Google wants to give people good search result so they are looking for this too. On the next level, we have quality links that may be in the same field as the website in question or a genuine directory. A medical practitioner may have a link from a government listing or a certified association, for example. A local business may have a link from their local traders’ association or their local council’s business network. So, Google has learnt to only follow quality links. It uses machine learning to match data from all over the web and cleverly denies any link juice to websites it considers unworthy. How are companies still beating Google? Detect the websites that offer links that Google follows and hit them hard. There are many legitimate websites that just don’t have the resources to check every new listing. Some of them are important websites such as newspapers which have so much credible information that Google would never want to blacklist them. Users can add multiple backlinks disguised in many different ways to gain many links. To explain it best I should give you a case study. The dentist who bent the truth (just a little bit). Richmond Family Dental employed Platinum Marketing to do some SEO work for them. Rather than go the path that Google outlines in its Quality Guidelines they decided to try beat the system, and it worked. They sought out credible sites to add their links to and went to town. One such site was the Noosa News. As part of News Corp, Google can ill afford not to index them. But the Noosa News website offers free business listings to local businesses. This allowed Richmond Family Dental to create 20 different business listing under 20 different business names each with multiple links back to different areas of their website. For example, a business listing ‘Invisalign Melbourne’ links back to their Invisalign page while one titled ‘Dental Implants Richmond’ links to their implant page. 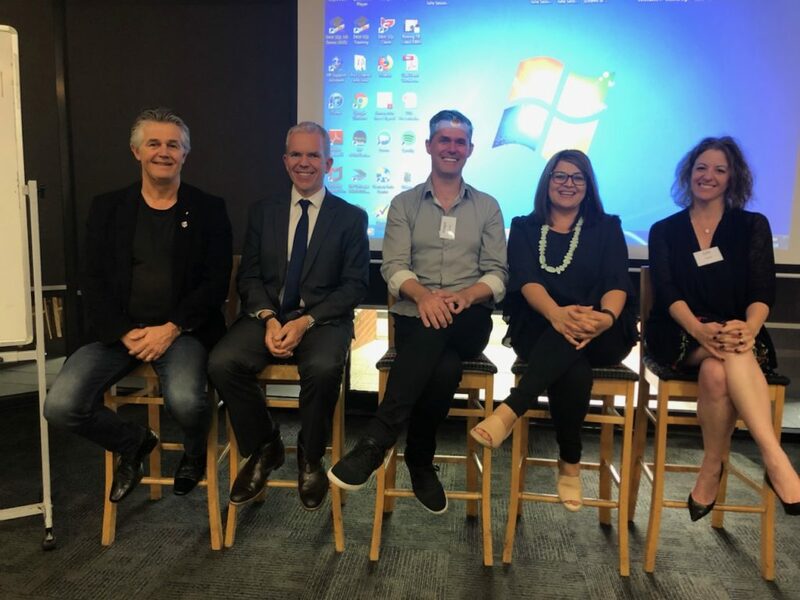 The intent of the site of course was to allow businesses in and around Noosa to create a single listing and link it to their site. I am 100% sure that they never foresaw a business 2,000km away listing themselves 20 times there. This helped some of their key pages climb dramatically. For one key phrase which would cost over A$14 a click in AdWords they managed to achieve an organic ranking of 9 on the SERP (Search Engine Results Page). This is an impressive result but at what cost. Surely the integrity of Richmond Family Dental hangs in the balance. They haven’t outright told a lie, but they or a company who represent them definitely have tried fool Google. As the user is inclined to see these rankings as being genuine evidence to the quality or popularity of a business or their service, they have inadvertently manipulated the public. This type of action robs other genuine business of their income and as it stands against the morals of any medical practitioner I have done business with, forges an unfair playing field. What do we expect Google to do about fake backlinks? For a start, Google is quite clear that this is against their policy. They have resources to allow reporting and an actual human being will look into it. Unfortunately, their reporting form doesn’t quite match the issue at hand. The closest form they have is hidden in some fine print at the bottom of a page on Link Schemes. Posted on 30 November, 2017 at 9:56 am. Posted on 29 November, 2017 at 9:37 am. Posted on 24 February, 2017 at 8:08 pm. Posted on 24 February, 2017 at 8:05 pm.